AMD may have just launched over 30 AM4 motherboards and Ryzen PCs to pave the way for its highly anticipated new processor, but it turns out, that was just a taste. 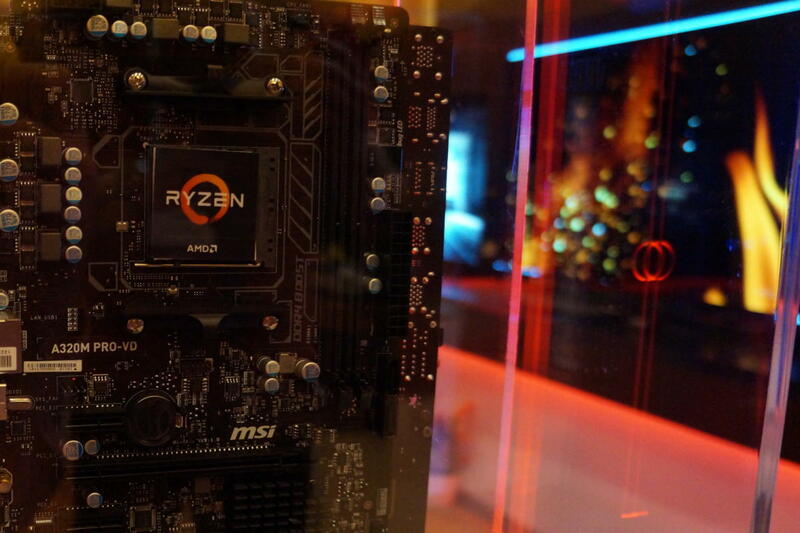 During a private meeting with AMD today representatives revealed several new juicy details about Ryzen, including what to expect from the chip family and launch, and a clue as to when the launch will actually be—or at least when it won’t be. 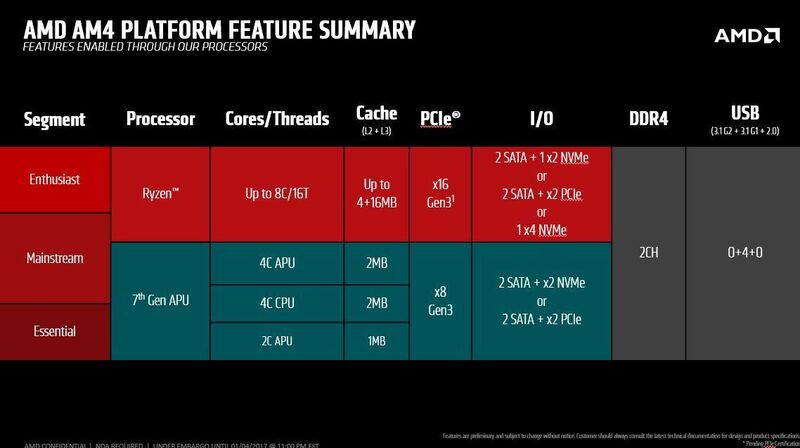 First, and most importantly: When Ryzen launches it won’t be limited to the high-end 8-core, 16-thread model AMD’s been showing in all its demos. AMD product manager Jim Prior tells me that Ryzen will be a complete stack of chips at release, though he declined to go into further details. 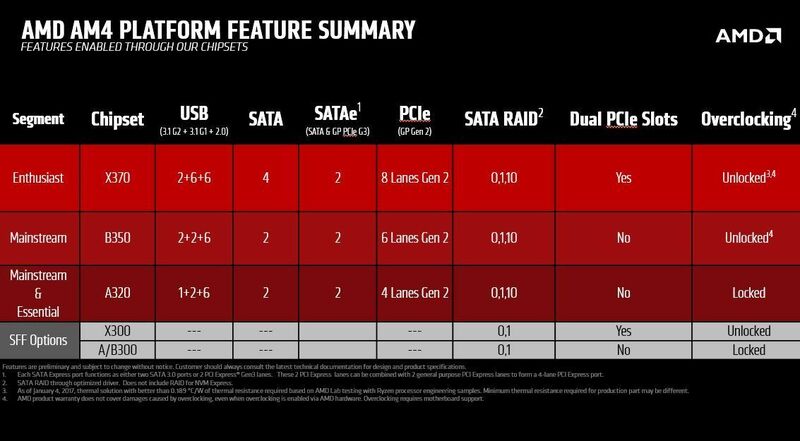 Furthermore, each and every AM4 motherboard, cooler, and PC that AMD announced last night will be available from day one. A custom AMD Ryzen PC build from Cybertron. That’s not the only interesting new tidbit. Prior says that every Ryzen chip you buy can be overclocked, following in the footsteps of AMD’s previous platforms—but that doesn’t mean you’ll be able to overclock every Ryzen PC. Ryzen and all of AMD’s new chips use the unified AM4 socket, which means you can drop any Ryzen CPU or Bristol Ridge APU into an AM4 motherboard and it’ll just work. AM4 supports several different chipsets, however, which give vendors greater flexibility in targeting specific motherboard designs for specific markets. While overclocking is supported with every Ryzen processor, only the more enthusiast-focused AM4 boards with X300, X370, and B350 chipsets will actually be able to crank those chips to 11 using all the fancy new overclocking technologies inherent to Ryzen. The supported capabilities of each AM4 chipst. 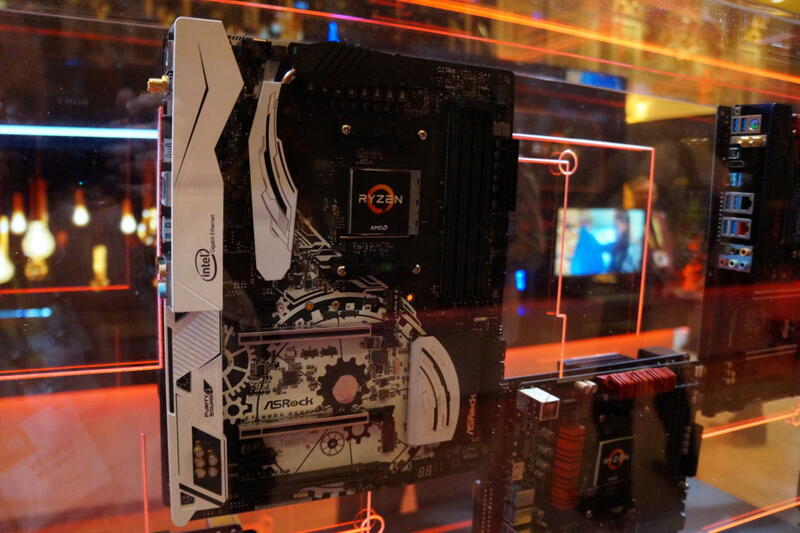 Likewise, only the tippy-top, enthusiast-focused X370-based AM4 motherboards will support Radeon CrossFire or Nvidia SLI setups for multiple graphics cards. When I asked why that was, AMD’s Rob Hallock said the company’s Radeon data shows that people who buy mainstream PCs simply don’t get into multi-GPU setups; the most popular Radeon cards for CrossFire are the highest-end models, and users slot those into Rolls Royce-style luxury rigs. Before you pick up your pitchforks, note that Nvidia’s Tom Peterson told us something similar recently regarding the use of GeForce cards in SLI. The tech supported by AMD Ryzen processors themselves. 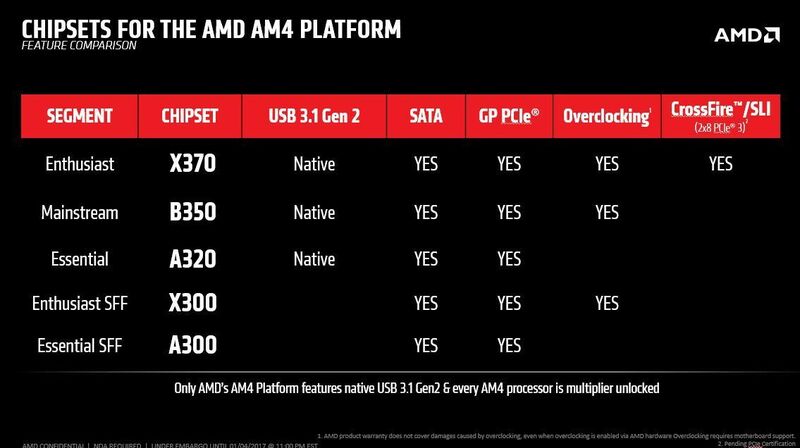 The extra features offered by AM4’s various chipsets. The chipset restrictions may sound weird, but remember that Ryzen is actually a system-on-chip rather than a traditional CPU. The processors themselves contain all the basic capabilities you need; the motherboard chipsets just add extra features various users may want. 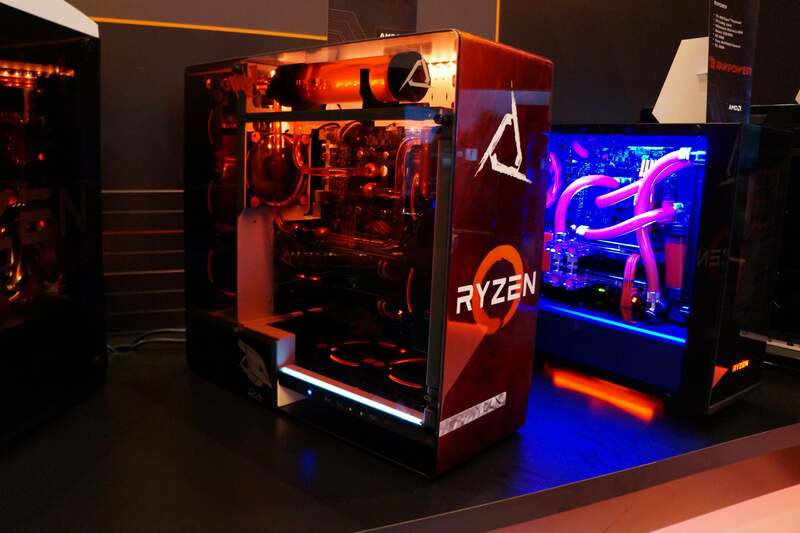 AMD designed it that way to grant motherboard makers and system builders extreme flexibility in how they want to design a system around a given chipset’s capabilities, which you can already see in the wildly varied designs of the PCs ready for Ryzen’s launch.